I’ve been spending some time away trying to declutter, purge, and complete little projects around the house. It’s been therapeutic tending to home and moving slowly for once. 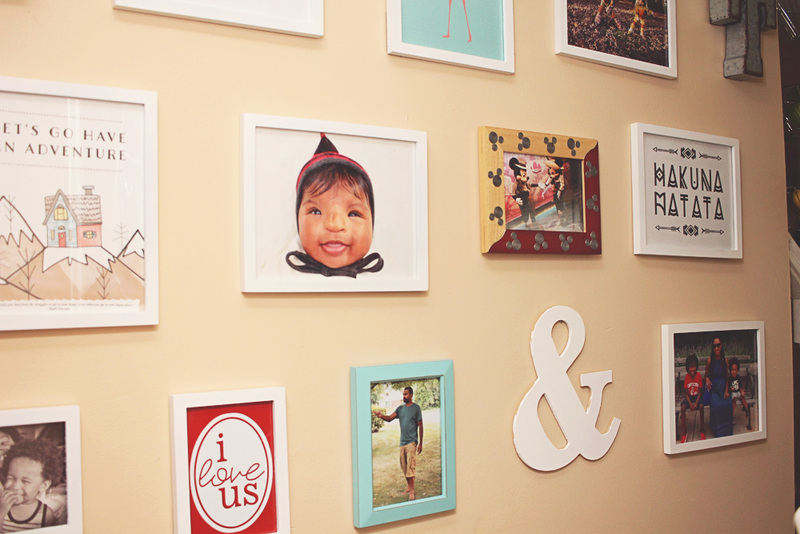 But I’m back today to share a quick and easy project that I tackled; a gallery wall in our hall. This wall in our hall had been bare except for Jayden’s artwork that I’d sloppily hung on the wall with gold Duck tape. Tsk, tsk, tsk. When taking down the white frames I had in our living room to prepare for upcoming maintenance repairs, I was left with a stack of frames needing to be put someplace useful. Stored away in a closet was not an option. It bugs me to the core when projects are left undone and things are displaced, so I had to act fast. While purging away, I started setting aside decor items that I had been hanging on to, but couldn’t quite figure out how to use them. I said to myself that if I didn’t find a use, then they’d have to be donated. Would you know that I had just enough pieces to execute that gallery wall I’d been putting off? I usually eyeball arrangements when hanging things on the wall, but I wanted to do things the grown-up way so that I wouldn’t mess up. I made a template using two long strips of the kids’ art paper. I arranged all of my frames and decor items on the paper and made marks to indicate where each item was placed. I then, taped the paper on to the wall in the hall (like this, but I didn’t cut out each frame). Once I hammered my first nail in, I decided to switch a few things around, rip the paper down and eyeball the rest. I’m such a rebel. This process took 30 minutes. It was so gratifying and I couldn’t believe it had taken me so long to get started. Next came choosing the new photos that would occupy the frames. I knew that deciding which photos to display would be an overwhelming task, so I quickly chose a few personal shots and had them printed at Walmart. I chose to fill the remaining frames with art purchased from Etsy sellers. I can always swap the photos to keep things fresh and give the old prints to the boys to hang on to or re-purpose in art projects. Had I put too much thought into this, the frames would still be randomosity on the wall. After putting the photos in the frames, I completed the gallery by painting a wood ampersand that I had stashed away in my craft drawer for years. YEARS. Majority of the frames are Mainstays Linear Frames. I love them because they are minimal and look great in any room. I added texture and pops of color with a galvanized T, wood ampersand, and some other frames I had on hand; one of which was a gift from Disney eight years ago. I totally had to display it now that we’ve done Disney together as a family. I’m so happy to have tackled this project even if I know that I’ll be replacing the photos. They’re current, which is more than I can say about the rest of our displays. This project gave me a little mojo to keep reinventing spaces in our little abode.